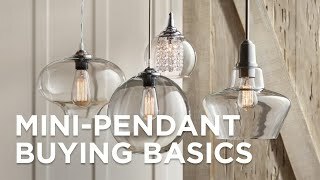 Polished nickel hardware and a mint metal shade make Mitzi collection's vintage style Blair mini pendant a surefire hit for any home. Simple and contemporary, the Blair mini pendant features a cool rounded ceramic cloche shade in mint that's a nod to vintage styles. Paired with polished nickel hardware, it's a sophisticated take on a truly indie look. By Hudson Valley, this mini pendant is perfect for breakfast nooks and over cafe tables. Polished nickel finish over steel construction. Mint metal shade. A Hudson Valley Lighting cone-shaped mini pendant that is crafted with metalfinsihed in polished nickeland suspended from a black braided cord. Hudson Valley Lightings Solaris conical transitional and Mid-Century mini pendant has a polished nickel finishdiamond-shaped perforationsand is ultra-stylish.